Oral health is imperative for general health. Oral diseases can vastly depreciate the quality of life of the individual, hence leading to long-term morbidity which would also have significant implications on an individual's functional, mental, and social well-being. Apart from individual outcomes, these diseases also have implications at the community level leading to loss of many working days which would have repercussions on the economic prosperity of society at large. Among oral diseases, dental caries and periodontal disease have been recognized as the most prevalent conditions across the globe. Children are predominantly susceptible to dental caries and gingival diseases due to changing dietary habits with increased consumption of refined carbohydrates and less focus on oral hygiene maintenance. These diseases although prevalent across most socioeconomic strata are more common among the poorer class largely reflective of the prevailing oral health-related inequalities in our society. The previous literature has shown substantial levels of dental caries and gingival disease among children of less effluent families. Although multiple studies evaluating prevalence of these disease conditions among children have been conducted across years, very few have covered a large scale of the population. It is imperative that adequate data should be provided for implementation of community-based programs. The present study hence aims to evaluate the prevalence of dental caries and gingivitis among corporation school-going children in Chennai city through a population-based cross-sectional study. The present descriptive, cross-sectional study was conducted among 3–19-year-old corporation school-going children of Chennai city after obtaining ethical clearance from the Institutional Review Board of Tamil Nadu Government Dental College and Hospital, Chennai. It was conducted for a period of 16 months. A sample size of 20,007 children (9707 males and 10300 females) was examined. Written permission was obtained from the district Educational Officer of Corporation. Written approvals were also obtained from school authorities before scheduling the survey. Informed consent was obtained from the parents of participating schoolchildren before carrying out the survey procedures. Information on demographic details and oral hygiene practices was collected from the participants with the help of case history format. Trained examiners examined all the schoolchildren. Loe and Silness index was used for recording gingival status. Dental caries status was classified based on the tooth involved into anterior tooth dental caries and posterior tooth dental caries. Further tooth with gross decay advised for extraction and tooth that demonstrated pulpal involvement with pain on percussion were classified separately. Treatment needs of the screened schoolchildren were also included on the basis of primary management, advance care, and no treatment-needed categories. Among 20007 children examined, 9707 (48.50%) were male and 10,300 (51.50%) were female [Table 1]. Out of 20,007 school-going children examined, 11,748 (58.80%) belong to the age group of 3–12 years, 7110 (35.50%) belong to the age group of 13–16 years, and 1150 (5.70%) belong to the age group of 17–19 years [Table 2] and [Figure 1]. 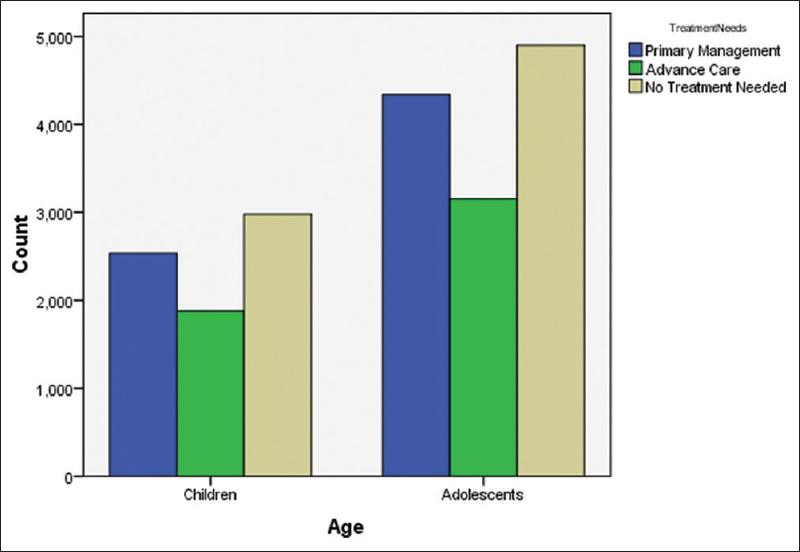 The prevalence of dental caries in the participants examined was 34.72% (6946) [Table 3]. About 1663 (23.94%) participants had dental caries involving single tooth, 293 (4.22%) had dental caries involving two teeth, and 4 (0.06%) had dental caries involving more than two teeth. Clinical pulpal involvement with pain on percussion was found in 4067 (58.55%) participants. Nine hundred and nineteen (13.23%) participants exhibited grossly decayed tooth advised for extraction. The prevalence of gingivitis in the participants examined was 8259 (41.28%) [Table 4]. About 2672 (32.35%) had mild gingival inflammation, 5563 (67.36%) had moderate gingival inflammation, and 24 (0.29%) had severe gingival inflammation based on Loe and Silness gingival index scoring [Table 4]. On the basis of treatment needs, 59.5% of the participants were in need of treatment. 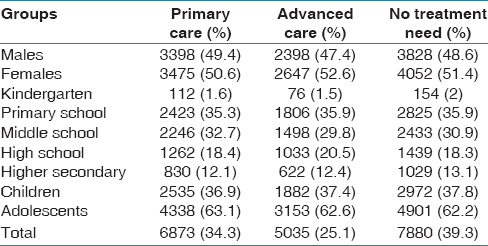 Almost 34.3% of the screened participants were in need of primary care, whereas 25.1% of the screened participants were in need of advanced care [Table 5] and [Figure 2], [Figure 3], [Figure 4]. Oral health is essential for general health and well-being throughout life and is a marker for overall health status. Dental caries and periodontal disease have been recognized as the most prevalent conditions across the globe. Children are predominantly susceptible to dental caries and gingival diseases due to changing dietary habits with increased consumption of refined carbohydrates and less focus on oral hygiene maintenance. These diseases although prevalent across most socioeconomic strata are more common among the poorer class largely reflective of the prevailing oral health-related inequalities in our society. The present study evaluates the prevalence of dental caries and gingivitis among corporation school-going children in Chennai city through a population-based cross-sectional study. Dental caries is an irreversible microbial disease of the calcified tissues of teeth, characterized by demineralization of the inorganic portion and destruction of the organic substance of the tooth, which often leads to cavitation. Although dental caries prevalence has declined worldwide in the past few years, it still affects children the most. Dental caries is the most common of the oral disease in childhood that is from the first through the 12th year of life. In this crucial period, the primary teeth are exfoliated, and the permanent teeth, exclusive of third molars, are formed and erupt into a functional pattern. The findings of several investigators indicate that at 1 year of age, approximately 5% of the children exhibit dental caries. The percentage increases up to 10% at 2 years of age. The trend continues, and at the age of 5 years, three out of four preschoolchildren have carious primary teeth. A considerable number of surveys have been done on dental caries experience in the permanent dentition. These studies are in general agreement that 20% of the children at the age of 6 years have experienced tooth decay in their permanent teeth. A rapid increase follows, and 60% at the age of 8 years and 85% at the age of 10 years are affected by dental caries. At the age of 12 years, when most of the permanent dentition has erupted, over 90% of the schoolchildren have experienced dental caries. The number of children with caries in industrialized countries is currently estimated to exceed 80% of the population, and in underdeveloped countries, the caries rate is thought to be much higher. In the present study, the prevalence of dental caries is 23.75% which is similar to the results of Mulu et al. and Gupta et al., The prevalence of dental caries as per the results of Goel et al. and Mulu et al. is 34.3% which is lesser than the results of the present study probably because of the less sample size of the above-mentioned study. The dental caries prevalence of the studies conducted by Ingle et al., Karunakaran et al., Arangannal et al., and Soumya et al. are 53%, 65.88%, 68.8%, and 65.3%, respectively. The present study revealed a lesser prevalence.,,, The probable reason might be that the above-mentioned studies included private schoolchildren whom had access and affordability for more refined sugars when compared to corporation schoolchildren who usually belong to less effluent families. Further, the present study also evaluated the treatment needs of the targeted population which demonstrated that half of the population was in need of either primary care or advanced care. This study is a first of its kind up to the best knowledge of the author, to identify the treatment needs of the targeted Indian population. The very reason for the Corporation school children to be selected in the present study is that, most of these children belong to lower socio-economic strata. The parents of these children work in a very poorly paid sectors who cannot afford private clinical treatment. Hence, with an insight towards improving the oral health of these children, the results of the study were presented to Chennai Corporation Mayor. Honorable Mayor included the same in the budget speech of year 2008-2009 (TN Gov/Chennai Corporation/Budget/2008-09) which made us achieve the goal of providing quality dental health care to these under privileged children. The present study reveals the current oral health status of corporation school-going children in Chennai city. The results obtained demand a special attention toward these children of less effluent families for the promotion of oral health by regular conduct of treatment camps by corporation and other agencies. Harikiran AG, Pallavi SK, Hariprakash S, Ashutosh, Nagesh KS. Oral health-related KAP among 11- to 12-year-old school children in a government-aided missionary school of Bangalore city. Indian J Dent Res 2008;19:236-42. Mulu W, Demilie T, Yimer M, Meshesha K, Abera B. Dental caries and associated factors among primary school children in Bahir Dar city: A cross-sectional study. BMC Res Notes 2014;7:949. Gupta P, Gupta N, Singh HP. Prevalence of dental caries in relation to body mass index, daily sugar intake, and oral hygiene status in 12-year-old school children in Mathura city: A Pilot study. Int J Pediatr 2014;2014:921823. Goel R, Vedi A, Veeresha KL, Sogi GM, Gambhir RS. 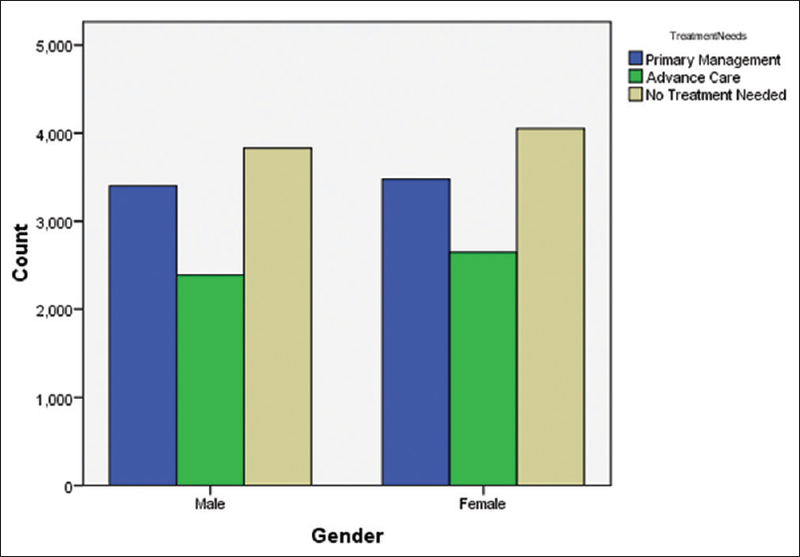 Oral hygiene practices and dental caries prevalence among 12 and 15 years school children in Ambala, Haryana – A cross-sectional study. J Clin Exp Dent 2015;7:e374-9. Soumya SG, Shashibhushan KK, Pradeep MC, Babaji P, Reddy VR. Evaluation of oral health status among 5-15-year-old school children in Shimoga city, Karnataka, India: A cross-sectional study. J Clin Diagn Res 2017;11:ZC42-7. Arangannal P, Mahadev SK, Jayaprakash J. 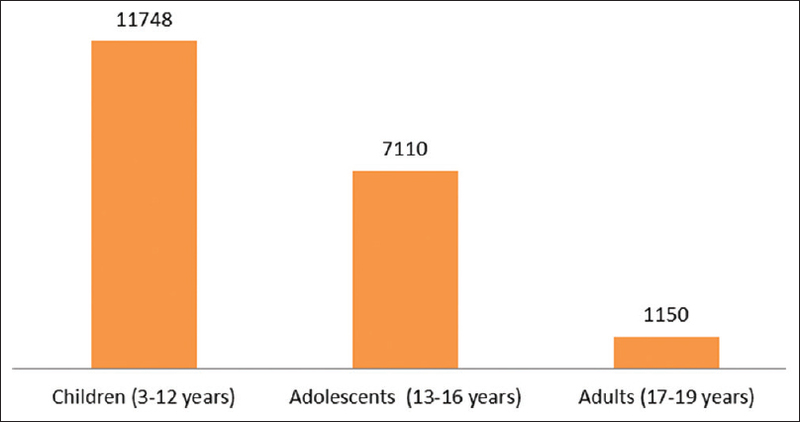 Prevalence of dental caries among school children in Chennai, based on ICDAS II. J Clin Diagn Res 2016;10:ZC09-12. Ingle NA, Dubey HV, Kaur N, Gupta R. Prevalence of dental caries among school children of Bharatpur city, India. J Int Soc Prev Community Dent 2014;4:52-5. Karunakaran R, Somasundaram S, Gawthaman M, Vinodh S, Manikandan S, Gokulnathan S, et al. Prevalence of dental caries among school-going children in Namakkal district: A cross-sectional study. J Pharm Bioallied Sci 2014;6:S160-1. Dhar V, Jain A, Van Dyke TE, Kohli A. Prevalence of gingival diseases, malocclusion and fluorosis in school-going children of rural areas in Udaipur district. J Indian Soc Pedod Prev Dent 2007;25:103-5. Available from: http://www.jisppd.com/article.asp?issn=0970-4388;year=2007;volume=25;issue=2;spage=103;epage=105;aulast=Dhar. [Last accessed on 2018 Dec 22]. Sharva V, Reddy V, Bhambal A, Agrawal R. Prevalence of gingivitis among children of urban and rural areas of Bhopal district, India. J Clin Diagn Res 2014;8:ZC52-4. Mathur SK, Roy RK. 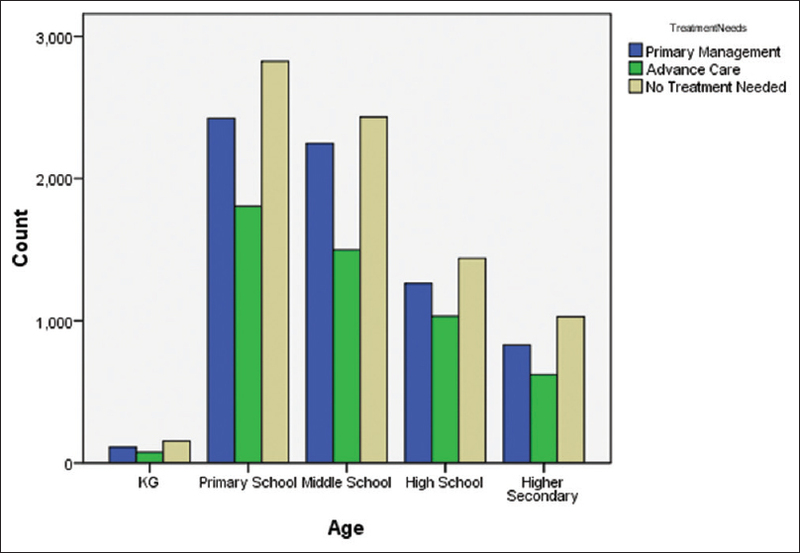 Assessment of oral cleaning habit, bacterial plaque, gingivitis among school children. JIDA 1931;53:329-32.